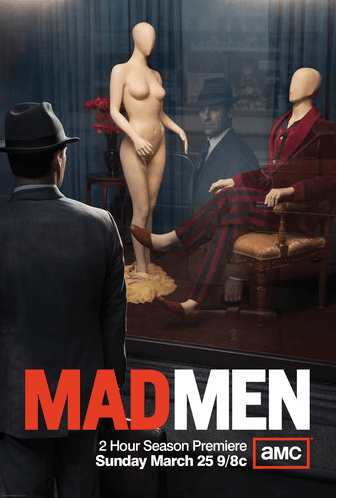 Delayed for 7-8 months, fans, and I count myself as one, are ecstatic that the 2-hour season premiere of the highly anticipated season 5 has a firm date – Sunday, March 25th 9/8 c, giving Mad Men fans time to stock the bar and plan a suitable menu! AND, to add to the excitement created by the 5 teaser videos and this provocative ad, for die-hard retro buffs, cooks, cocktail aficionados, and party planners who desire to delve into every detail of the period, there’s The Unofficial Mad Men Cookbook, by Judy Gelman and Peter Zheutlin. Now you can dine like Don Draper and drink like Roger Sterling with more than 70 recipes from the kitchens, bars, and restaurants seen on episodes of Mad Men! Want to learn how to mix an Old Fashioned just the way Don Draper likes it, or prepare Oysters Rockefeller and a martini the way they did fifty years ago at one of Roger’s favorite haunts, the Grand Central Oyster Bar? Packed with period detail, The Unofficial Mad Men Cookbook provides invaluable historical and cultural context for the food and drink featured on the show, tips on throwing a successful 60’s cocktail party, and even a guide to favored Mad Men hangouts. To ensure an authentic Mad Men experience, every recipe is introduced through a specific scene in the show. I found this to be a wonderful way to refresh my memory and recapture moments from Seasons 1 through 4. Oscar night was the perfect opportunity to prepare one of the recipes from the book – on a recent trip to New York, we spent several nights at the legendary Waldorf Astoria Hotel, so it was a toss up between the Waldorf Salad and the Blini and Caviar. Both were appropriately elegant; as you can see I went with the caviar because, to me, it screams 60’s panache! 1. In a large bowl, sift the flour and baking powder together. Add the milk, sugar, and sour create. Beat the egg until frothy, add to the batter, and stir well. Let batter stand for 20 minutes. 2. Melt butter on a griddle or large skillet. Fry small (2-3 inch) pancakes in very hot butter. Drain on paper towels. 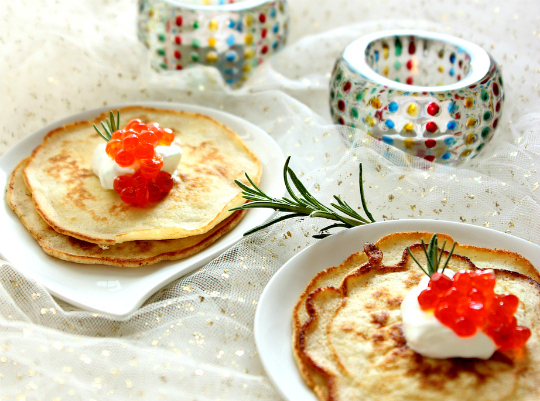 Top each blini with additional sour cream and caviar before serving. But wait – there’s more! Through the Dine Like a Mad Men Sweepstakes, to launch The Unofficial Mad Men Cookbook, fans can enter to WIN a meal at one of New York’s finest restaurants featured on Mad Men including Barbetta, Keens Steakhouse, Algonquin, Pierre Hotel, and the Russian Tea Room through April 2. I think it would take a life time of training for me to be able to drink like Roger Sterling 😉 Love your retro blini…so beautiful and delicious! 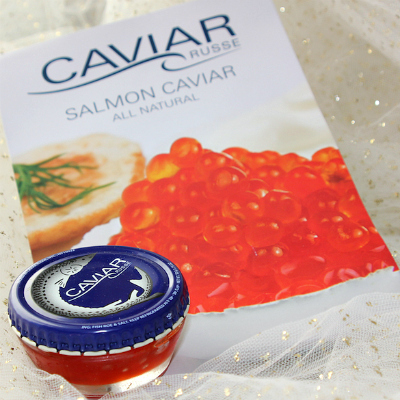 Although I don’t watch Mad Men, I will most certainly take a plate of that Blini and Caviar! Again, your photos are gorgeous! And NOW I absolutely need the cookbook! We just started watching Season 1 of Mad Men…and I am hooked. Glad it’s got so many seasons under its belt, we can continue to enjoy it for a long time. I am a huge Mad Men fan, and cannot wait till season 5 finally begins! Great to know that there’s a cookbook, thanks! Oh I love this post! Love the caviar and the thought that Don Draper will be back soon in my “living room”! Thanks for sharing this recipe & the telecast reminder. Can’t wait for Mad Men! Cheers! Whaaaa!?!? Mad men cookbook! I need this in my life. I was just talking to my friend yesterday about hosting a Mad Men themed premiere party. Now I will know the perfect things to make! 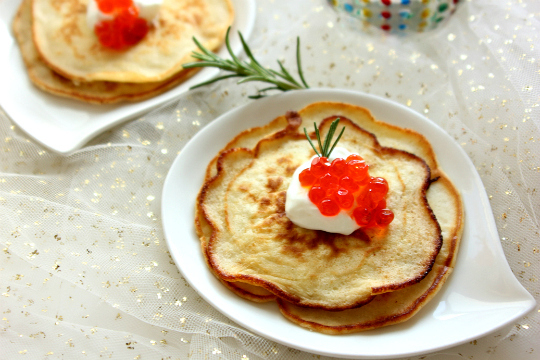 Gorgeous pancakes with caviar! Simply irresistible! Such lovely photos!! They are so bright and vibrant. So nice to see all those colors when it is almost Springtime! Never heard of the “Mad man”before, I ll check it out later. 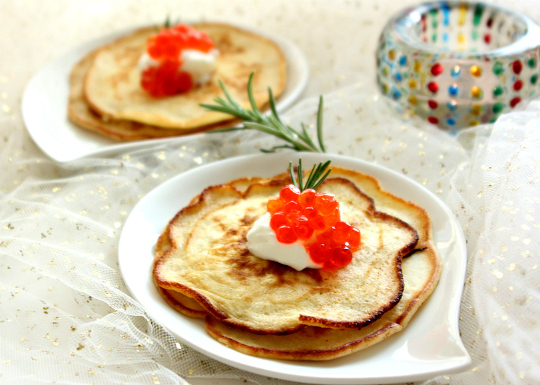 Now your blini look mesermizing with the caviar on top, so very pretty!